Not that I will be using them in Age of Sigmar, they will be Khorne's Chosen in games of Warhammer, Dragon Rampant, Saga and such like. These are damned impressive models, full of detail, which can take a while to paint, but I reckon they are worth the effort. I still find it hard to believe that these are plastic models in a starter set. In fact, I rate them higher than the new multi pose set, they are posed so nicely and fit together a dream without any awkward joins. 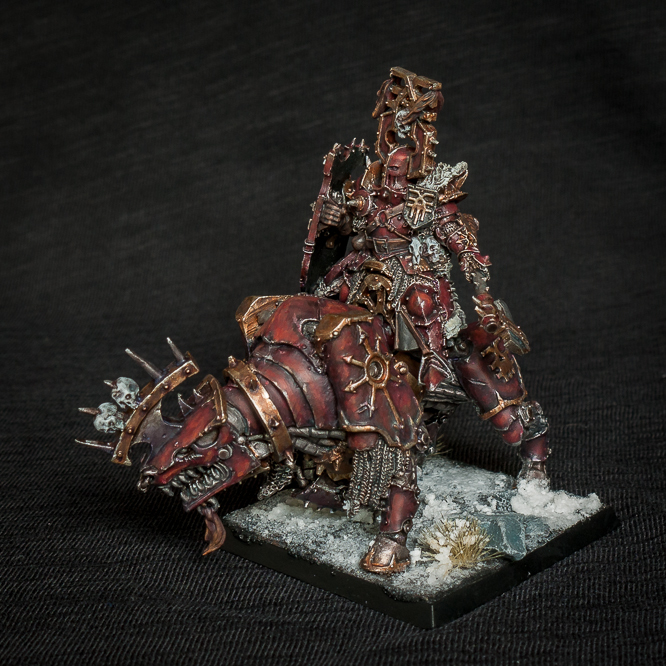 The palette is classic Khorne style - red, brass and black. For the hair and beards I chose something a little bit different - thinking that they are based on archetypal viking berserkers, I went with stereoptypical Nordic blonde. I'm a bit uncertain about this decision, the blonde braid keeps reminding me of Goldilocks, not sure that is a good thing! The two main characters from the boxset are still to be painted and added to this unit, then I will probably take on the marauders. 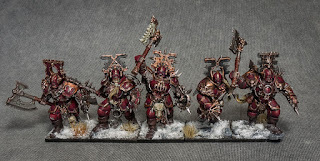 I am hoping to get enough Khorne troops together to play Dragon Rampant, which I believe is scheduled for release around xmas time. The perfect time for the guys in red to go frolicking in the snow. 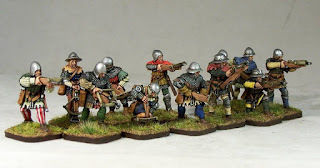 I started playing medieval gaming with Lion Rampant just this year. 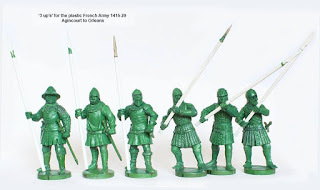 At the time I looked around at everything on offer and decided to collect a Wars of the Roses force, based on Perry Miniatures plastics. Partly this was because of the low cost, but mainly because I was unable to find what I really wanted - decent 14th or 15th century sculpts. How things have changed in just a few short months! 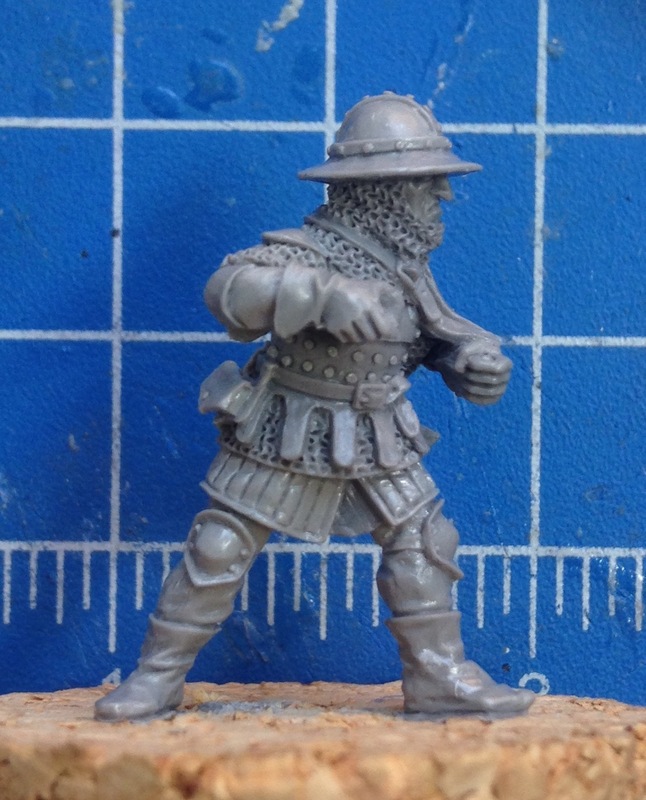 Claymore Castings produce some excellent stuff, their crossbow unit jumped to the top of my buying list - sadly I have been able to get just one pack to date as the company seem to have had some casting problems over the summer, hopefully now rectified. 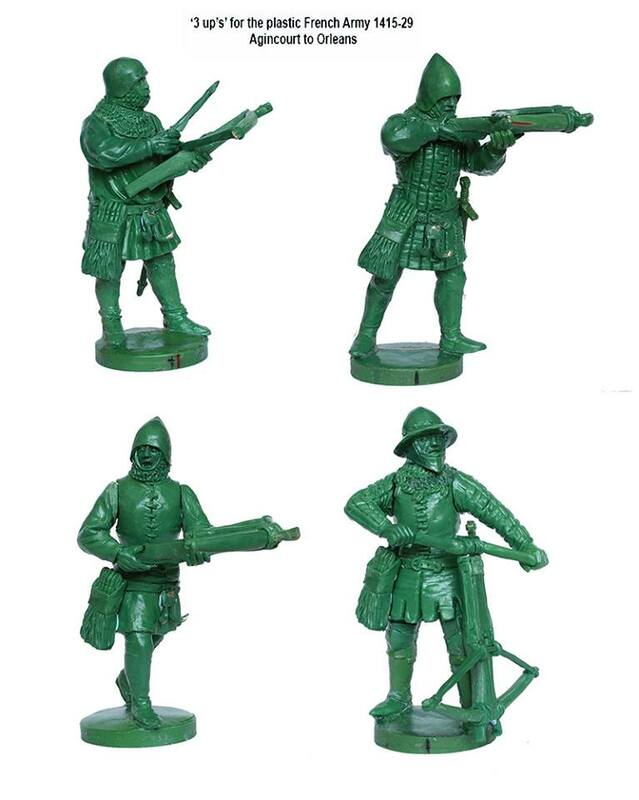 These are metal figures sold at a very reasonable £6.50 for a pack of four. 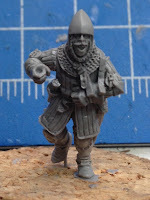 I prefer plastic or resin models, but I will make exceptions for quality castings such as these. 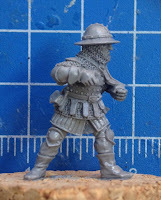 In the pipeline they have some very characterful spearmen previews, another must have for my collection. 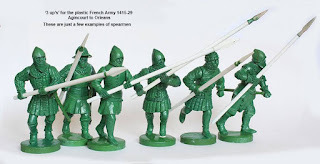 Top of the plastics manufacturers to my mind are Perry Miniatures. 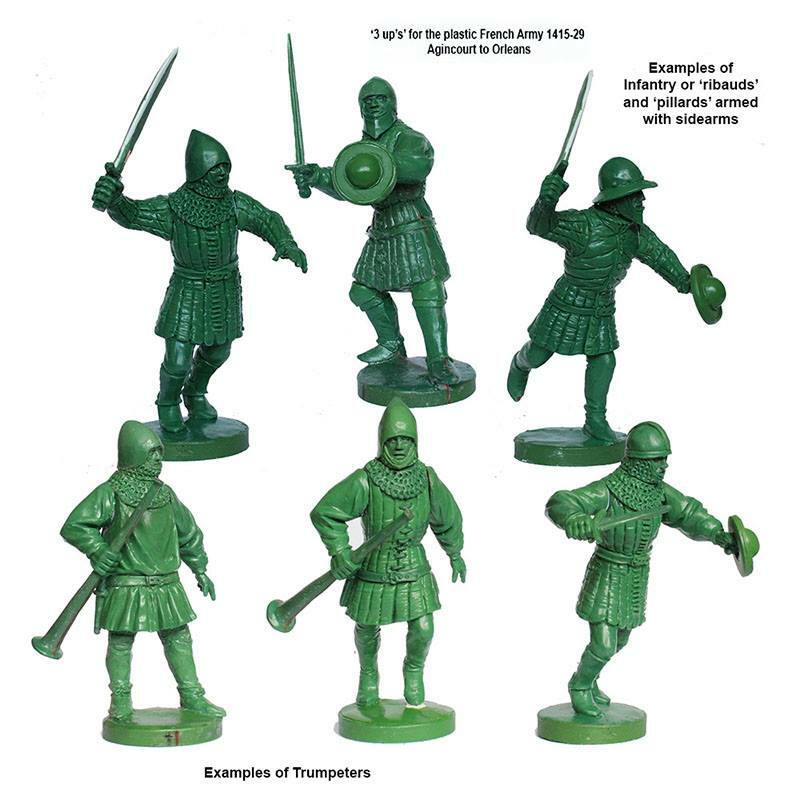 Their English (Agincourt) army was very tempting, a complete Lion Rampant retinue in a box costing around £20, with some very nice sculpts, but I passed on it because I thought it would be too similar in gaming style to my Wars of the Roses force. 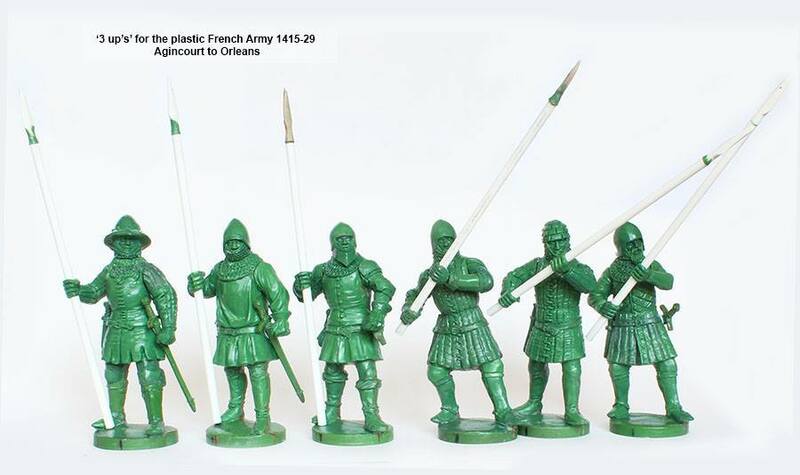 But just a couple of days ago they released images on their facebook page of the French Agincourt army and this looks far more promising. More crossbows and spearmen to add to the collection. There's plenty of material here to make up foot troops galore, with the prospect of mounted troops further along the line? 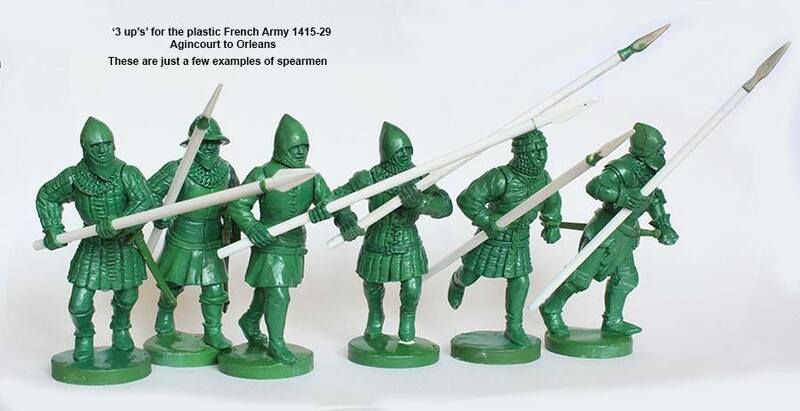 It's great to see some historical miniatures that can match the high quality of my fantasy collection. 2016 is shaping up to be a good year already. 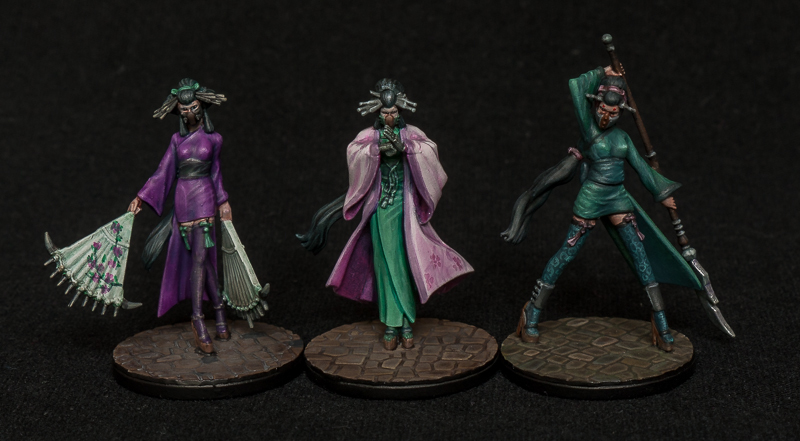 The first three members of the shadowy Silver Serpent Society are finally painted and ready for action. The final member of the triad is Lotus, with her deadly bladed fans - the design is meant to represent cherry blossom, if you google Japanese fan you will see this is a common motif. They have been a real challenge to paint, so many tiny features, though I enjoyed the vibrant palette as a change from my usual earthy, realistic approach. I will most likely go back and repaint the bases as I am unhappy with them. The three figures make up the Malifaux box set, the Oiran. For my own purposes they will be used in games of IHMN, as the more basic foot troops of the Serpent. Being martial artists, with silk robes and throwing blades, I reckon they will be quite a handful. These ladies have been on the slow boat from China, at an average of less than one completed per month, hopefully the next few will be a little quicker. No toy soldiers in this post. 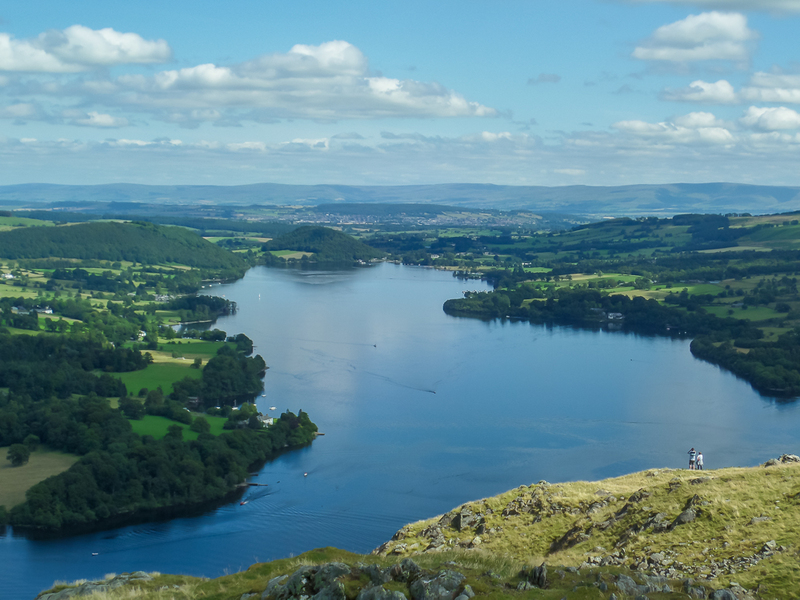 After a particularly poor summer here in the north west of England, a beautiful day beckoned me out on to the fells, a brief walk up on to Hallin Fell in fact. It's good to get away from the desk, stretch the legs and back muscles, feast the eyes on something further away than arm's length. Normal service will be resumed next time, but just wanted to pause and enjoy the weather for once. 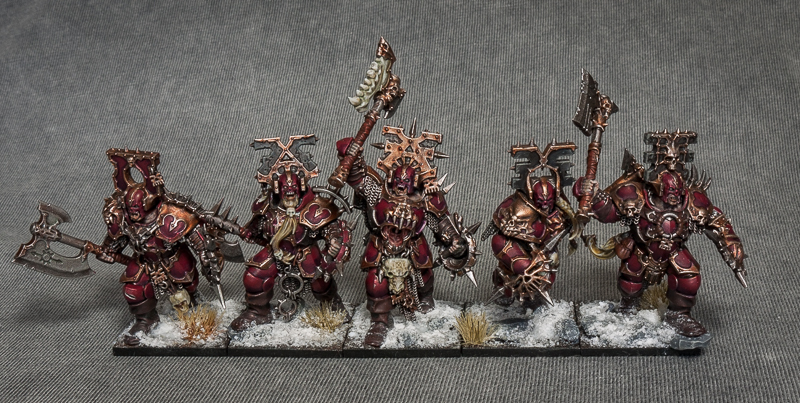 The build of the Khorne force continues with the first unit of marauders (bloodreavers). I decided to split the figures from the box into two lots of ten, the second unit I aim to modify to give shields. 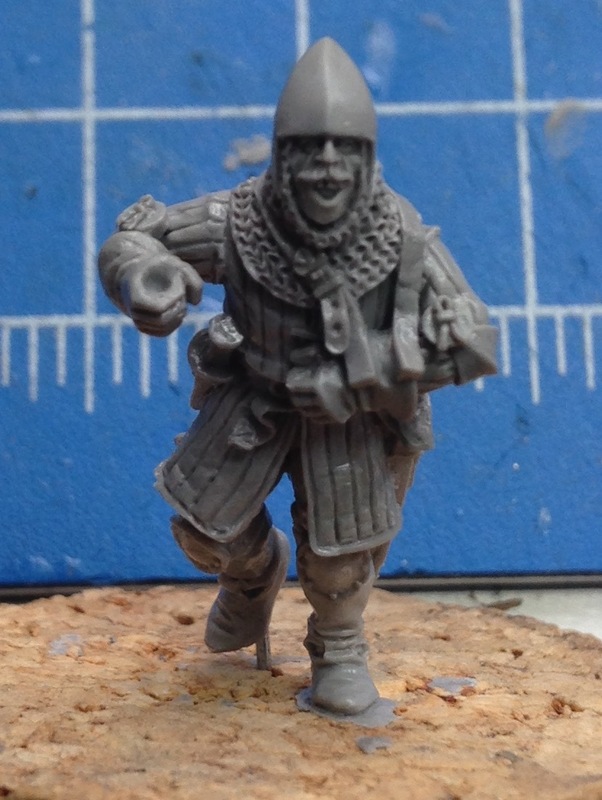 This unit gets the full command - the horn blower is lurking in the second rank, though I might swap this around a little when I build the second set. 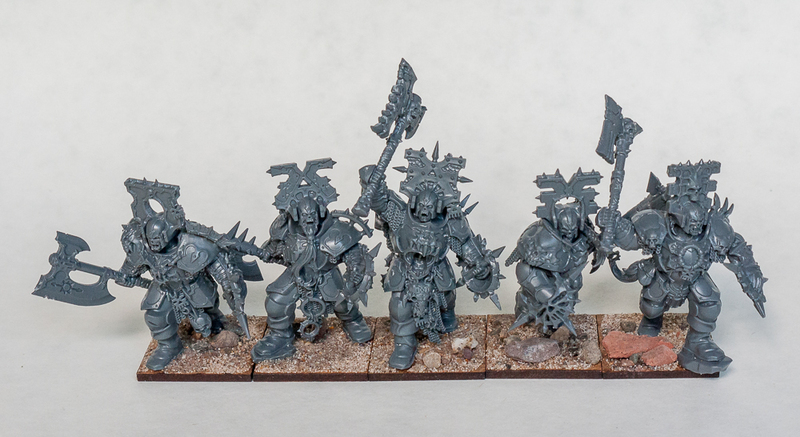 As with the blood warriors, I was careful to ensure they ranked up on 25mm square bases before I fixed them in place. 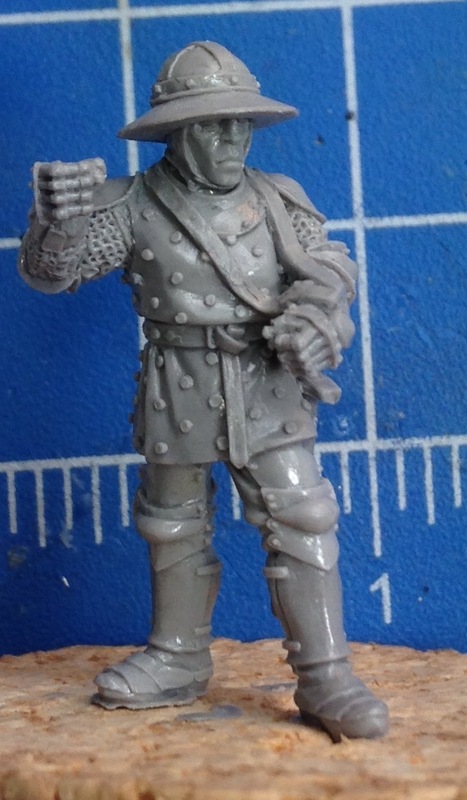 The special guest is a skaven rat ogre from the Island of Blood boxset, minus head and tail, with an ogre head added. It's a really simple conversion that requires no greenstuff. He's mounted on a cavalry base (50mm x 25mm) to fit into this unit, though you could easily put him on a larger square base and use him as an ogre, or a troll with a different choice of head. If you wanted to, you could scrape off the stitches and smooth over the joins to make him more "hulk" than "frankenstein", but that's a little too much beyond my skills I think. 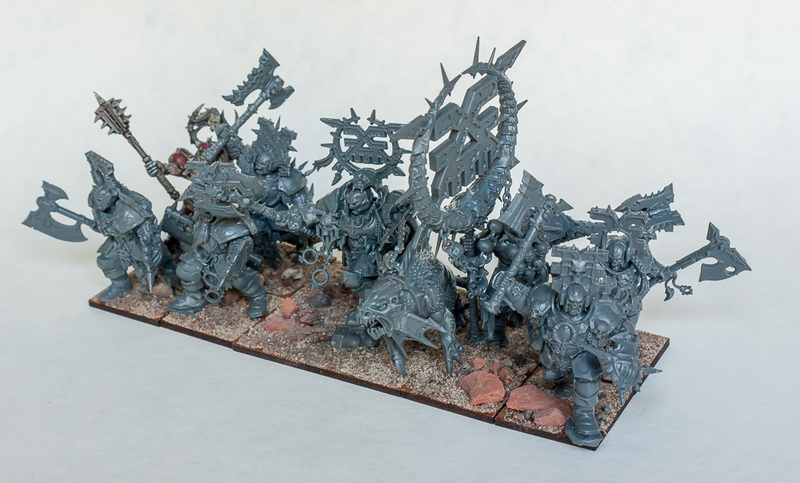 I am pretty pleased with him, he looks right at home in this unit of frenzied marauders. I was also careful to ensure that the unit ranks up with or without the big guy, for those days when they get sick of his body odour and leave him back at camp. 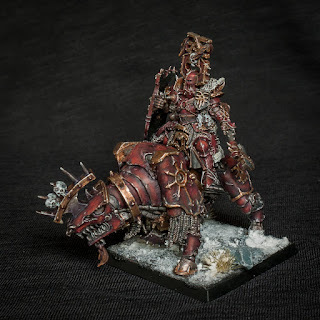 Here's another model that I started several years ago, then languished, then finally I got finished. It's been in my collection for about 5 years, I made a half-hearted attempt some years ago but then fantasy gaming waned and it was put to one side. 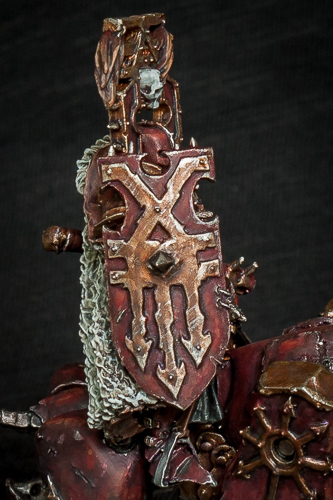 I spent a little time over the weekend repainting the metals, the reds and adding the details. It gave me an insight into how to tackle the upcoming Chosen unit. 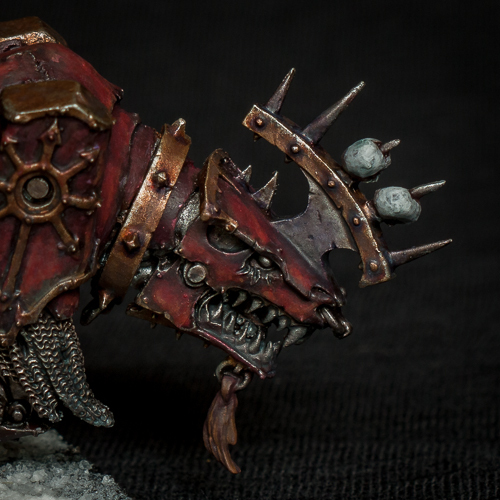 I am pretty happy with the brass/gold areas, but I think I overworked the red armour. I should have stuck to my usual mantra - keep it simple. A base colour, a wash or glaze or two is usually sufficient to get a decent finish. 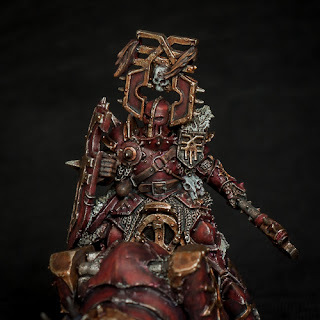 By the time I had messed up the red armour I just wanted it done, I could go back and work the fleshy bits of the jugger but it hardly seems worth the effort. 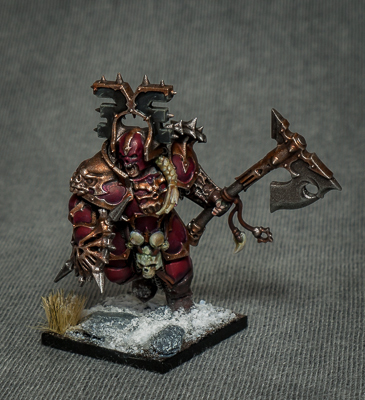 The Khorne Lord has a reasonable contingent of followers already painted, including ogres, marauders, chaos warriors, and more ogres. The contents of the AOS box will add a unit of Chosen and another unit of marauders. 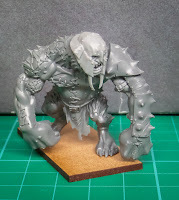 The large beast thing will be converted into a daemon. Searching through my bits I do also have some metal bloodletters that would be nice to add to the army. Anything that causes lots of damage in combat is a candidate to join the warband, hence the troops generally being armed either with two weapons or a great weapon (though I slipped up when arming the Lord, for some reason he has a shield). I really hope I can maintain enthusiasm to complete the AOS items before I move on to another project. After assembling the chaos/blood warriors I was keen to move on to the characters. 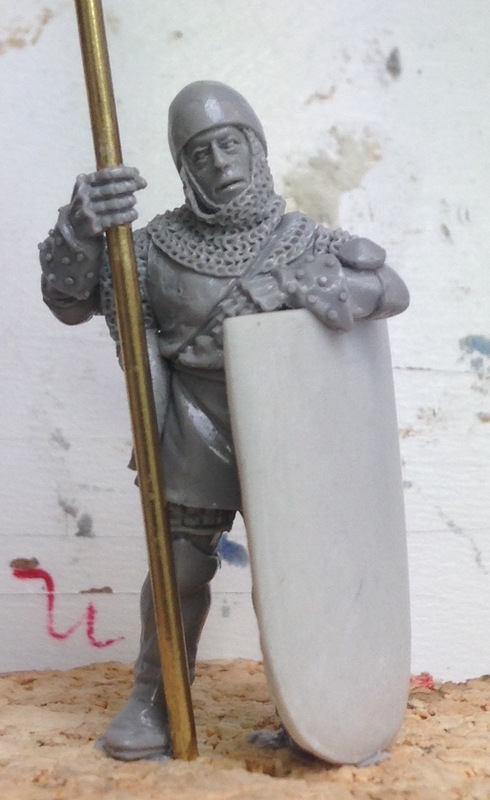 The Lord with his hound and the standard bearer are truly magnificent sculpts. The quality of the casting is first class and the engineering is quite mind blowing. There are few, if any, in the industry that can match this kind of level. The figures are mounted on mdf bases, these will have thin magnetic sheet attached to the underside for use in movement trays. If you are careful you can rank up the warriors and the characters so that they combine into one unit like this. In Warhammer game terms, this is a unit of 12 Chosen Warriors. 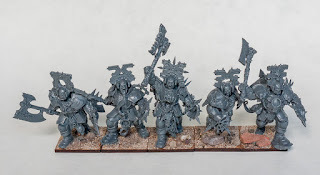 All my existing chaos warrior units I field six wide, so I wanted to repeat that with these figures. With two such imposing characters in the unit I don't think they can be anything less than the Chosen Few. The guy in the back row on the left is an old metal champion, he's a bit short really, even standing on a rock slate. 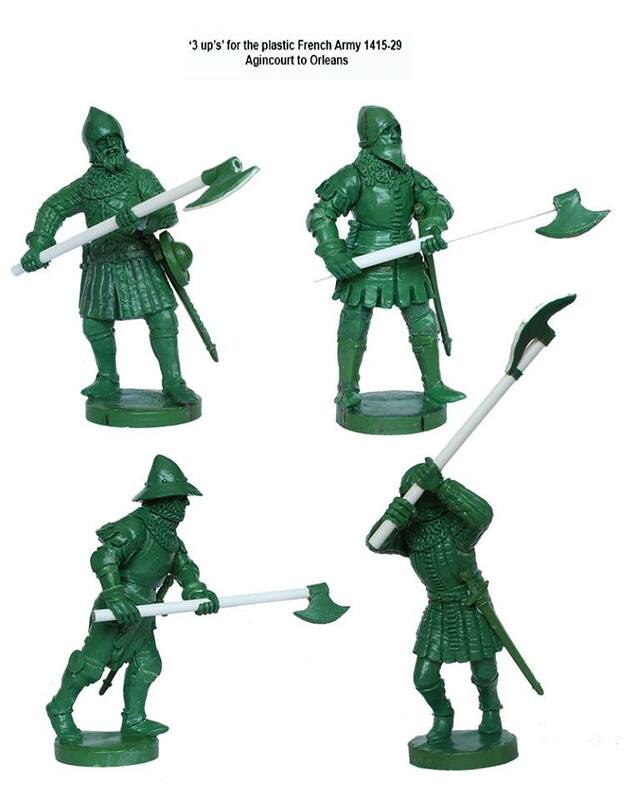 There is one remaining plastic figure from the boxset, armed with a whip, but I will probably be using him in the regiment of marauders as he's fairly lightly armoured. In other gaming systems, the unit can be used in different ways. In Dragon Rampant, units of hard hitting warriors are six strong, so the basic five warriors plus the standard bearer can be used. In Saga, elite units are just four strong, maybe the character model with hound could be a warlord. In element based games, like Kings of War or Hail Caesar, then obviously the whole unit is deployed as above, takes a certain number of hits and is then removed. Being able to switch from skirmish to ranked and back again, I see that as being easier on these square bases. Flexibility across different systems is important to me, you never know what the latest must-play game will require. Hopefully these square bases will give me options in just about any gaming system. 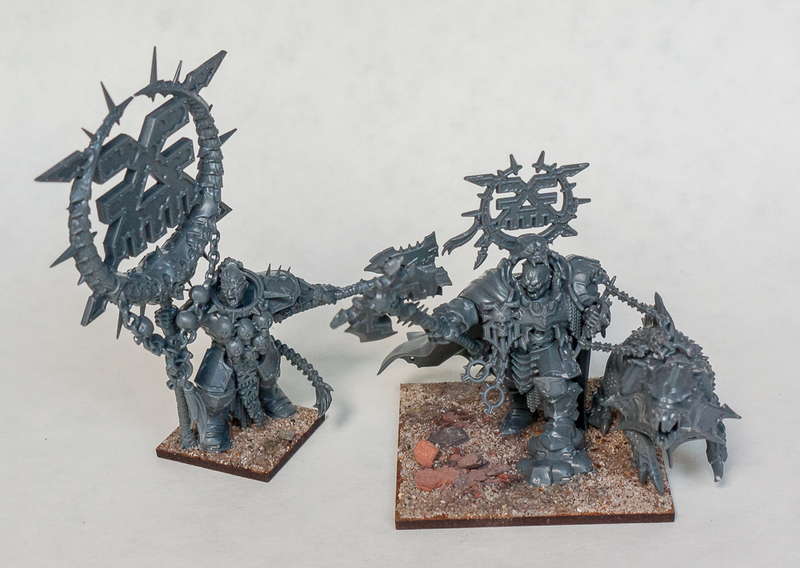 I decided that the chaos half of the Age of Sigmar boxset would make a nice addition to my chaos warriors army. Once the boxset arrived, I put together the warriors first. Cleaning the mould lines was quite time consuming, getting the knife blade round all those spikes....so many spikey bits! Assembly was straight forward for the most part, the instruction booklet is comprehensive. I would advise dry fitting every component before you apply glue, not just the ones suggested in the pamphlet. One or two of the assemblies are almost as challenging as Rubik's Cube. I wanted to stick with square bases to fit in with my existing army, so was keen to see how they looked. In skirmish formation there's no problem whatsoever, but if you want them to rank up like this care should be exercised in how you fix them to the bases. These are temporarily attached as a test, to standard GW plastic bases (although no longer standard I guess). As you can see it is possible to have them in close formation, you might have to put a rock or two in place to make ranking easier. 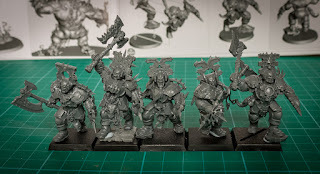 Finally, how do the new figures compare with existing chaos warriors? This photo shows the newcomer among some of my collection, they match particularly well with the existing plastic chaos warriors. The red armoured warrior is raised slightly by a magnetic strip. 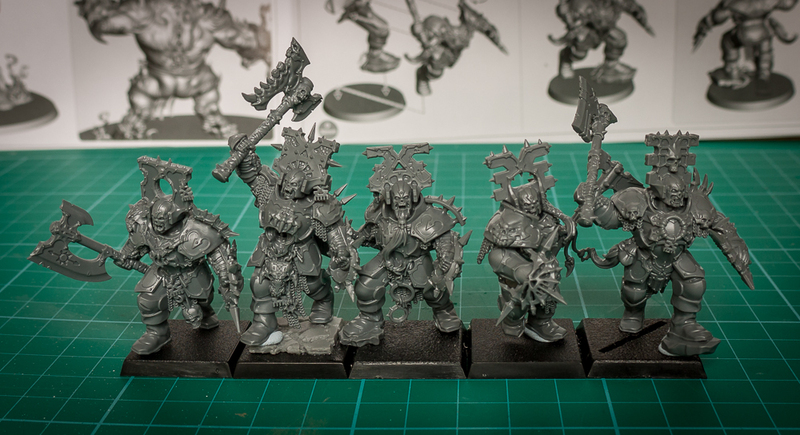 The odd one out here is the figure on the right, that's an Avatars of War corrupter. He's a little smaller than the others (compounded by his shorter base), but I will happily mix all these into one army.